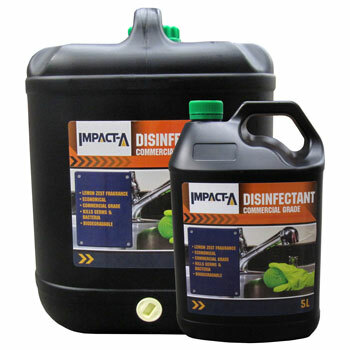 Impact-A Commercial Grade Disinfectant is an ammonium compound disinfectant cleaner effective against a wide range of microorganisms including bacteria. The disinfectant has a Lemon Zest fragrance which provides a lingering perfume to aid in the deodorising of odours. It contains a powerful biodegradable surfactant capable of removing fats, oils, greases and general dirt and grime.